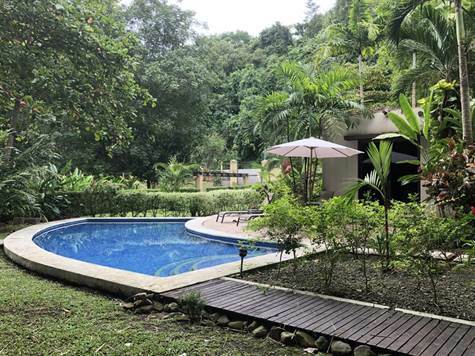 Peaceful Nature Retreat Home conveniently located just off the main highway and bordering Carara National Park Nature Reserve. Tucked in the rainforest, this property is all one level featuring large master bedroom with full bathroom, owners closet and jacuzzi tub; two guest bedrooms, open kitchen and dining area with inlaid garden with an oriental zen feel. This house is a nature enthusiast’s haven complete with its own Macaw nesting area on site. The property has an ample amount of parking space with a portion that can be used for expansion opportunities as well. House is sold fully equipped, furnished, and ready for occupancy; and currently serves as a second vacation home for the owner. Crown Jewel in between the rainforest, mountains in the beach - 15 minutes to Los Suenos, 25 minutes to Jaco Beach.